What’s a eurosplash? Tile from counter to ceiling that gives this handsome gray kitchen its unique look. When it come to kitchen tile my motto is “more.” That’s why the design for my kitchen began with tile. And it’s likely why a New York restaurateur chose a subway tile eurosplash look for her stunning gray, black and white Greenwich Village kitchen. 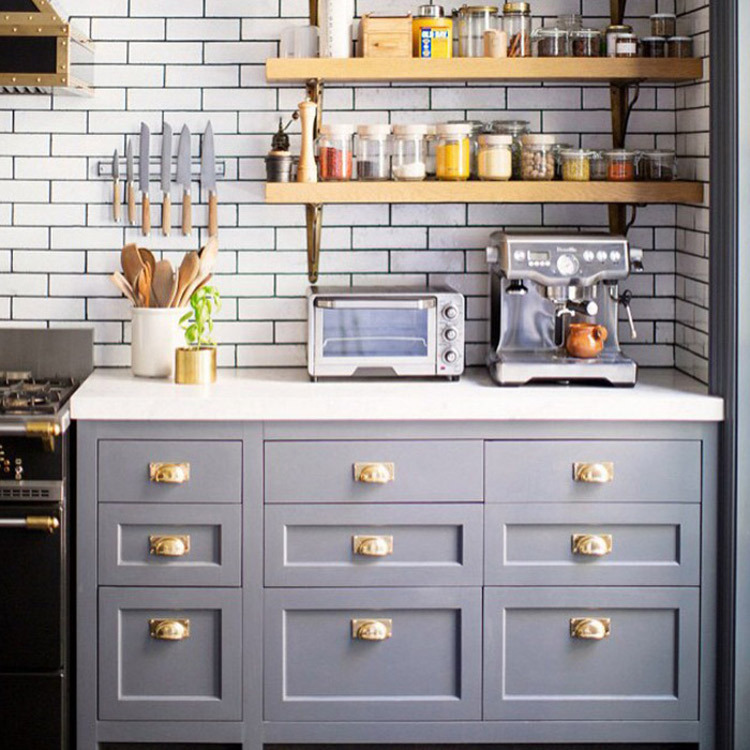 With five kids in the house, the white subways set with black grout are practical, too. The subways run counter to ceiling all along the range wall [top]. 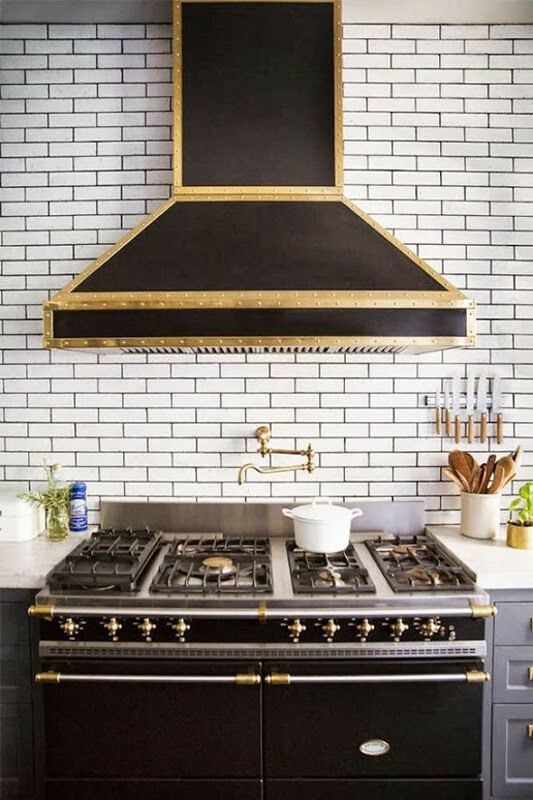 It’s important to have a heatproof material behind a powerful range like this black Lacanche and tiling behind and all around the matching range hood keeps the look consistent. Open shelving on the right side of the range also benefits from a consistent background. And shelves that are installed through a layer of tile are guaranteed to be extra sturdy. Shelves are mounted high enough for small appliances like an espresso machine and smart oven to fit below. And the combination of top drawers with slab fronts, and paneled Shaker style drawers below, combines both a modern and traditional cabinet look. Note that brass accents on the range are picked up in the cup-pull cabinet hardware. A large kitchen island has bar-height seating for the family plus a large sink. But my eye went directly to the window wall where the subway tile eurosplash goes full height — floor to ceiling. 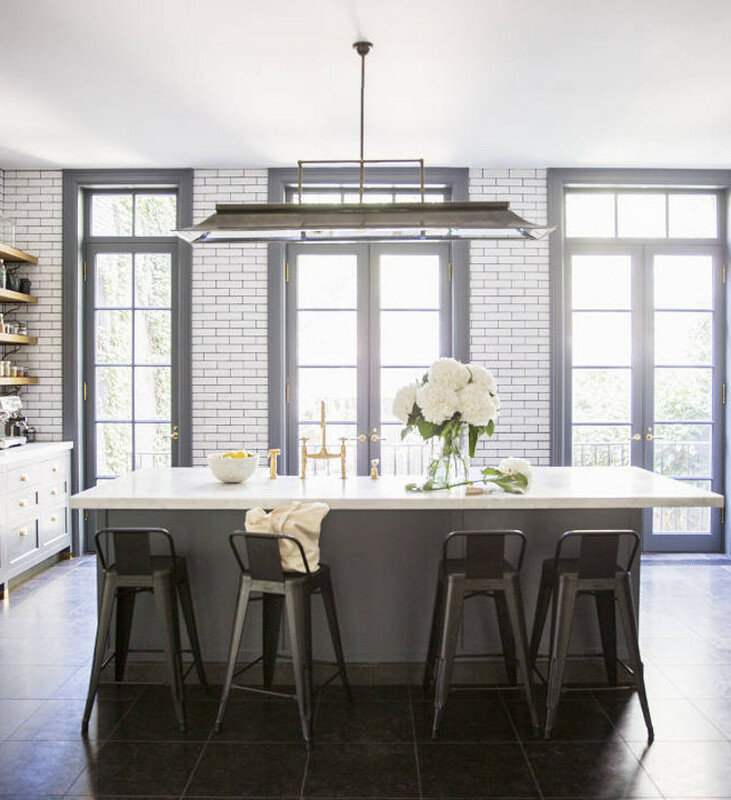 This reprises the fully tiled look of Victorian kitchens but the medium-gray door and window trim — as well as the Jean Prouvé style industrial bar stools — keep things chic and modern. I love this kitchen! Could you please share what the tile dimensions are and what brand of tile this is? The tiles look to be 2 x 8 to me. I don’t have the brand but that is a modern while field tile size that could come in glazed ceramic or porcelain tiles. Shouldn’t be difficult at all to find several options.